Travel to the extremes of the Southern Hemisphere in the footsteps of explorer Ernest Shackleton. Enjoy views of spectacular mountains, towering icebergs, and abundant wildlife in Antarctica and in South Georgia. The unique Fly and Cruise format of this itinerary offers the benefit of speed and comfort. Instead of spending multiple days sailing from South America, across the notorious Drake Passage - renowned for its stormy waters, you will board a four-engine jet and in just about two hours arrive in Antarctica, where your ship will be waiting. Arrive in Punta Arenas, Chile, where you are welcomed and transferred to your hotel. You should plan to be in Punta Arenas at 14:00 hours, at the latest. Later, gather for a welcome dinner and meet your fellow adventurers while enjoying a typical regional menu. Expert polar guides share their passion for Antarctica through an engaging program of illustrated presentations, and lead you ashore to interpret the wildlife, history and many wonders of the Antarctic environment. Your expedition may include visits to sites such as Port Lockroy, where you can send a postcard home ! Other stops may include:- Petermann Island, Paradise Bay, the Lemaire Channel or Prospect Point. Each voyage is unique and each is crafted to provide the best possible overview of the varied Antarctic environment. You will spend time on and off shore - boarding Zodiacs to enjoy the various rookeries or simply, cruising amidst the ice floes and dramatic shapes, carved by the sea. This truly is a magical wilderness and no two voyages are the same, flexibility is key to any successful voyage and the Expedition team will set the voyage route, while taking advantage of the ever-changing opportunities that nature provides during your visit. Sailing north, we hope to stop at Elephant Island. It was here that the crew of Shackleton's Endurance found refuge while he and five handpicked men carried on to South Georgia. While the stormy conditions of this area rarely allow a shore landing, you will see the island from the ship. As we sail northward, our historian and our naturalists offer a series of presentations. There is time to socialise in the ship's lounge, while keeping an eye out for the region's abundant birdlife. More time at sea to prepare for your upcoming landings on magnificent South Georgia. The briefings on board will guide you through the endemic wildlife and the incredible history of the region. The island of South Georgia is a diverse landscape of majestic mountains, massive glaciers, grassy uplands and deep fjords. Over the next three days, there will be plenty of opportunity to uncover all that the island has to offer, including the wildlife havens of Salisbury Plain and St Andrew's Bay, where Kings can be seen in their thousands. South Georgia is steeped in polar history and you will be able to visit the former whaling outpost of Grytviken, where you may pay your respects at the simple grave of Ernest Shackleton. At Cooper Island, the nesting home of thousands of black-browed albatrosses, see a large colony of macaroni penguins. If the weather is favourable, visits are also planned at Fortuna Bay, Salisbury Plains, Prion Island, and Elsehul Bay. This isolated island also supports substancial populations of fur and elephant seals which can be seen hauling out onto the beach. The wildlife found here will certainly not disappoint and for those who like to spend their time behind the lens, South Georgia is often referred to as a photographer's paradise and you will very quickly understand why ! As the ship heads towards South America, you will have plenty of time to reflect on the past few days spent in this incredible wilderness. During the days at sea, the program of presentations will continue, further enhancing your knowledge and understanding of this region. As the ship edges closer to Ushuaia, enjoy the company of your fellow expeditioners. Spend time out on deck spotting marine wildlife or make use of the time in the ship's presentaion room, editing the photos from your fabulous trip. 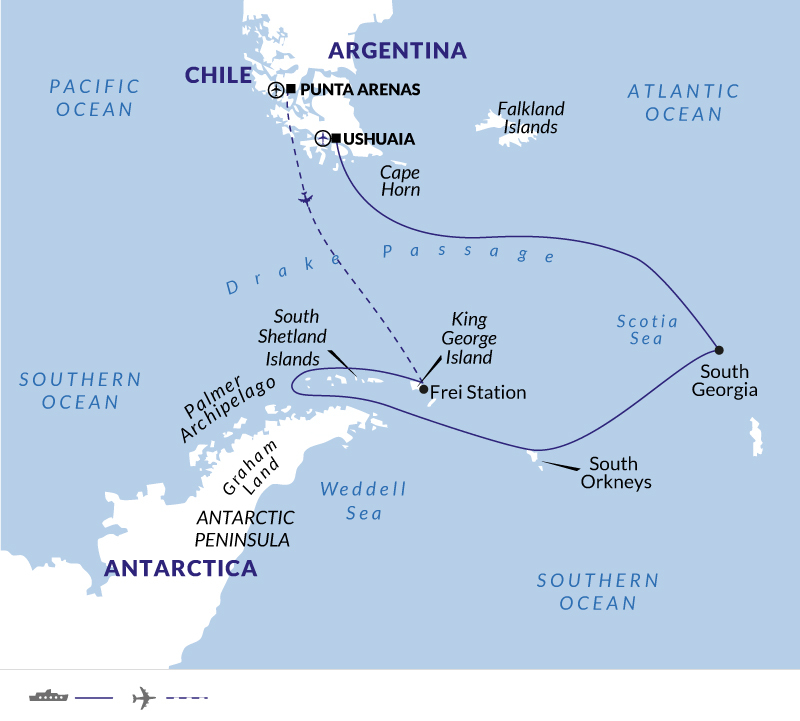 Today, you will sail along the Beagle Channel. Take in the beauty of Tierra del Fuego and Navarino Island, as you make your way into Ushuaia. Kayaking is bookable in advance via the ship's operator. The hiking and snowshoeing program is a small-group experience limited to a maximum of 12 participants, led by a Mountain Guide. This optional excursion is offered and organised on board by the ship operator. As most landings in Antarctica are wet landings, the best footwear is knee-high waterproof boots. You will not need to carry them with you, as you will be provided with a pair of thermal rubber boots to use, before arriving in Antarctica. Ensure you take some comfortable shoes or trainers for relaxing in whilst on board. The maximum weight allowed on the flights to and from Antarctica is 20 kg (44 lbs) per passenger, including hand luggage. The baggage weight limit is a technical requirement imposed by the flight operation. Unfortunately, it is not possible to purchase extra allowance. Note that at certain points during the expedition you will be required to handle your own luggage. A hairdryer is available in each cabin. The MV Magellan Explorer is a new and modern expedition vessel, custom-built for Antarctic air-cruises. She was built in Chile to the latest Polar Code specifications and carries a Polar Class 6 ice-class. Due to start service in the 2019 Antarctic season, the ship accommodates 69 passengers in seven categories of accommodation, including dedicated single cabins. All cabins have a wardrobe, individually controlled heating system, a sitting area and a private bathroom with shower. Most cabins, with the exception of porthole cabins, also have a balcony. The ship features a glass-enclosed observation lounge and presentation room with state-of-the-art audio-visual equipment, a spacious and stylish dining room, well-stocked bar, a library, gym and sauna. The forward-facing observation deck leads to the bow of the ship and offers a fantastic viewpoint, from which to observe the passing marine wildlife. Prices are based on the use of outward facing, twin share Porthole Cabins. They are spacious and comfortable, with private facilities and a porthole. The MV Magellan Explorer offers single, twin/doubles and triple suites, all with en suite facilities. Call us for further details of cabin choices and we will talk you through the options. Daily buffet breakfast and lunch are served on board the ship, offering a wide choice of dishes. For dinner, you will be offered a choice of three main courses. Wine, beer, juice and soft drinks are served with lunch and dinner and are included in the cost of the trip. Complimentary coffee, tea, hot chocolate, water and snacks are available throughout the day.